In December 28th, I enjoyed Inuyama autumn festival as volunteers. I'd like to show schedule of the festival was the below. We can enjoy the Windup doll's show (Karakuri Ningyo) of floats (Yama) at Shiro-Mae-Hiroba in the daytime and 10 floats with Japanese lanterns (Yo-Yama) in the nighttime. ・On the second day is Japanese samurai parade. We can enjoy the parade of Japanese samurai in suit of armor and Matchlock gun show by the samurai (Hinawa-Ju Enbu) in the daytime. But I was joined the Japanese samurai parade (Sengoku-Busho Monogatari) as volunteer on the second day. And the weather on the day was so nice like the weather in Vancouver summer! At 10 am, I got together to change my cloth to parade costume at 10 am. Everything was the first time for me, so it was very difficult and I needed the help putting on the traditional Japanese costumes. So, general Japanese especially men usually don't know the way putting on Japanese traditional cloth. At that time, I met one international samurai! You might understand the Japanese armors by the picture. The quality was so nice and the armors were making noises when they were running, and it made me remember the fact written on the book that samurai put straw into the chinks between their armors to keep silent when they tryed night attack. By the way, I took his picture when we had our lunch before the parade. And he is famous in MC of radio in our area. Anyway, we paraded with more than 260 samurai to Inuyama castle. We couldn't take any pictures during the parade, so I took our float in the place where we waiting to start before the parade. Can you understand the atmosphere? I don't know the actual parade and I felt bit regret, because of we couldn't watch it. And the next picture is the float that we pulled it to Inuyama castle. Three ladies dressed with traditional princes cloths and one Japanese traditional general were on the float. I took it at starting place so there are some ordinal houses on the picture, but there are a lot of Japanese traditional style houses and shops when we parade the castle town. This time, I'd like to update some pictures when I visited at Nabana-No-Sato to enjoy a lot of tulips in April. Nabana-No-Sato is an one of the parks of Nagashima Resort, which contains Nagashima onsen (Hot springs), Jazz Dream Nagashima (outlet mall), Nagashima Spa Land (amusement park), in Kuwana city in Mie prefecture. The Nabana-No-Sato is very famous at our local area, so I was also interested in the park and I visited there! At the Nabana-No-Sato, we can mainly enjoy a lot of seasonal flowers. On the other hands, their illuminations in winter are also so popular, the number of lights is the biggest in Japan. Anyway, I update the pictures at Nabana-No-Sato in April! This is a pond at the center of the Nabana-No-Sato. Can you see a lot of flowers surrounding the pond? It's so beautiful, right? And the tulip festival was held at the Hana-Hiroba, which is a main open space of the Nabana-No-Sato. It's the first time for me to see such a lot of tulips in my life. Tulips have a lot of colors, so they colored the field beautifully. But, if we attentively see the field, we notice the fact that there're some pansies between tulips. And the tulips weren't bloomed yet, I guess that it's to delay to bloom. If there're no pansies, the field with no bloomed tulips isn't nice, right? So pansies also let visitors enjoy the tulips always. I took this picture on the small hill. There were a lot of visitors even if it was weekday. If the day was weekend or holiday, it would be busier. Every path, where we walked, is decorated with flowers after tulip field. I think that it's hard to trim the garden, but I was hankering the job. Next pictures were taken at begonia garden. And I would like to show them. I took this picture after entrance. I think that some group of tourists would take their souvenir pictures here. There were several so unique flowers at begonia garden. And they look like tropical flowers, right? I took the picture of so beautiful pond at end of begonia garden. It let me remember Butchart Gardens in Vancouver Island, Canada. Butchart Gardens are one of the most famous gardens in the world, and it was just breathtaking for me. I took the picture in front of Chinese restaurant after begonia garden. We enjoyed full-blown peach blossoms that are suitable for Chinese restaurant. Peach blossoms are bigger than cherry blossoms, so it's bit difference from Japanese elegance. But I can understand Chinese love peach blossoms. This is the final picture that I took at the exit. The flowers were full-blown in April and I really enjoyed them! It was so nice! I want to visit there again in other season. I'm sorry, I didn't update since last month. This time, I want to update about the second day of Inuyama festival, but the point aimed at is bit unique. The first day, we enjoy the windup doll so I directed my attention the cherry blossoms around Inuyama castle on the second day. These pictures shows the cherry blossoms on Gose River that is also moat of Inuyama castle. The day, the blossoms were so beautiful, and the beauties were based on Japanese cultures. When I walked along the river, I remembered the cherry blossoms at Chidoriga-Fuchi next by Japanese Imperial Palace called Kokyo. I guess the atmosphere of the cherry blossoms on moats that surround Japanese castles would be very similar by the fact that I remember the cherry blossoms at Chidoriga-Fuchi by the cherry blossoms in Inuyama. We also found some carp streamers called Koi-Nobori swimming over Gose River. It's so rare to enjoy cherry blossoms and Koi-Nobori at the same time. When I turned my attention to the surface of the river, I found a lot of the petals. The time of Inuyama festival is same as full-blown of the cherry blossoms in Inuyama. I felt lonesome when I imagined the blossoms were going to fall soon after the Inuyama festival. I went over the Gose River after enjoying the cherry blossoms, there were some floats in preparation for the night festival at down town of the castle. At the first day, we couldn't see the night festival by rain. So I aimed at night festival at the second day! This is a barrel of free Japanese Sake for every body who enjoys the festival. The tast was so nice and I was so surprised to be honest. Before this festival, I believed that Japanese Sake in Toyama was the best for me, but I found the fact that some Japanese Sake in Aichi were also very tasty! This festival changed me to love some Japanese Sake in this area. This is the stone monument that is describing there was a mile stone of Nakasen-do had been here. Next time, I want to show the night festival! Last weekend, I enjoyed Inuyama Festival (Inuyama Matsuri), so this time and next time, I'd like to introduce the festival on my blog. The Inuyama Festival has a long history of 373 years and it also be designated as one of the nation's significant intangible folk cultural asset. So the festival is one of the biggest festivals in our area. Every year, we can enjoy the festival for two days, so I can't write about the festival only once and I would need two or three articles for the festival. The first day called "Shingaku-Sai" is April 7th, and the second day called "Hongaku-Sai" is April 8th. The both of the days, total 13 floats (Yama) are get together in front of Haritsuna shrine under Inuyama castle, and then their floats dedicate their wind-up doll's (Karakuri Ningyo) Show in daytime, and we can see the very beautiful 13 floats with 365 lanterns lighted by candles in nighttime. In Spring, a lot of cherry blossoms are in full bloom in the castle town of Inuyama city. We can enjoy the wind-up doll's Show of the festival, and also enjoy the beautiful cherry blossoms and the float in the nighttime. 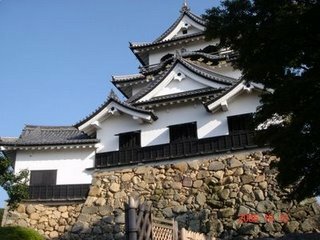 I want to recommend you to visit in Inuyama city in the season. On this article, I describe the wind-up doll's Shows of the floats (Yama) in the first day. When I arrived at the Haritsuna shrine at the castle town in Inuyama city, there're a lot of floats like the picture. The number is 13 and every float has the wind-up doll's show, the fact is rare thing in Japan. The structure of floats have a three-story and the first is for musical accompaniments, the second is for four or five people handling the wind-up dolls and the floor is covered by curtain, and the third is the stage for wind-up dolls. This is a picture of the musical accompaniments on the first. We can see some children who look five years old beating Japanese drums. But there are also some adults performing Japanese flute. The floats have four wheels and they can only move backward and forward. So they don't have any functions turning right or left, so they should turn by the only power of people. So the floats make their tire tracks after turning. Can you see the tracks on the picture? I took the people pulling the float. The front pullers decide the way, the pullers under the float push the float and the back pullers push and steer the float. I took the pullers taking a rest after moving to the place in position with their float. We can have every alcohol on the street in Japan, so the festival is really an exciting time. And one of the highlights is wind-up doll's (Karakuri Ningyo) Show, and I enjoyed two kinds of the wind-up dolls. 1. The dolls turn in to a something. 2. The dolls give an excellent performance. So, let's check out some pictures of the wind-up doll's Show. At first, the doll of the float turned into the shrine. The doll entranced on the stage, and danced, and then turned into the shrine. When we enjoyed the transformation, the audience made a storm of applause. Of cause, I was included such audience. I took the pictures during the shrine was turned into the doll again. It was interesting for me. The six floats started to move to Inuyama station after their performances. The windup doll Show on the picture is the doll pick a bud of a red flower and put it into the stand. After putting, the bud flowered and the doll and the flower started to dance. I was surprised when the red flower was flowering and spinning. This windup doll was born from the white sphere, and the doll went up the stairs. Finally, the doll flew at a makimono that is a hand scroll. The letter written "the sun, the moon (Nichi Gettsu)" rose. Can you see the first picture and guess the gimmick? The doll was going up the stairs. I can't guess it, and so amazing! This doll also nice! The right doll…..
…beat the drum during hand standing on it. The next is really fantastic! The left doll standing on the stage…..
ridded on the other doll's shoulders. And the doll took him to the place under the bar. And the doll grabbed the bar and lifted up. Finally, the doll turn twice with the bar! I can't understand the gimmicks. The next windup doll Show is Urashima. The story of Urashima is one of the most popular old tales in Japan. And the show based on the story. The girl who is Otohime entranced on the stage with a box called "Tamate Bako". Can you see the doll that has white hair with smoke? After opening the box, the box gave smoke to him, and it made him be old. After windup doll's show, we were caught in the rain. So we couldn't enjoy the festival at night.